If youth is wasted on the young, irony is also wasted on the ignorant. 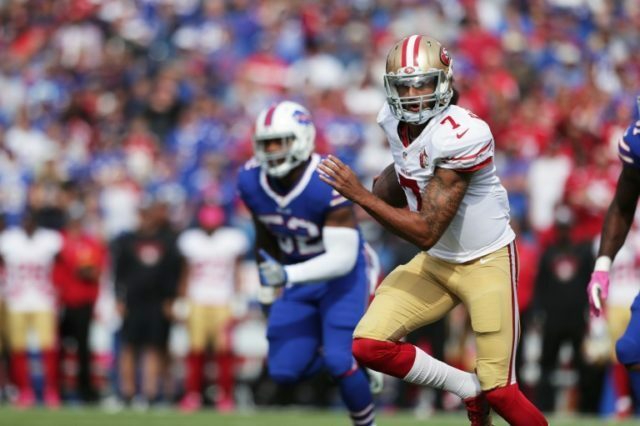 Kaepernick, assuming his old post as starting quarterback for the San Francisco 49ers, was showered with boos as he led the offense on to the field to start Sunday’s matchup with the Bills. When he kneeled for the national anthem, joined by teammates Eric Reid and Eli Harold, chants of “U-S-A, U-S-A” broke out amongst the New Era Field crowd. By the end of the game, a landslide 45-16 win for the Bills, Kaepernick defended his protest against racial injustice and police brutality that soon will enter its third month. “I don’t understand what’s un-American about fighting for justice and liberty for everybody,” Kaepernick explained to reporters. Of course, this same Colin Kaepernick wore a Fidel Castro t-shirt to a press conference, where he lamented oppression and injustice. So, perhaps Kaepernick’s failure to view the disrespecting of his country’s flag and anthem as “un-American” shouldn’t come as a shock. Kaepernick also claims that a man who had his funeral attended by thousands of people, including former heads of state, somehow died in vain. Not to mention the absurdity of Kaepernick’s claim that he, a net historical nothing, would have the power to redeem Ali. When Ali took a stand against what he perceived as social injustice, he didn’t do it in the seventh round against Joe Frazier. He didn’t make the boxing arena his “protest arena.” He recognized that fans came to watch him in his professional capacity as a fighter, not as a protestor. A fact, in addition to a great many others, clearly lost on Kaepernick. Maybe we can all appreciate the irony that on Sunday, Kaepernick got crushed by a team that just so happens to wear red, white, and blue.